Christopher Cone is incisive in his critique of Reformed Thought. Cone has earned three doctorates and is a great communicator. While I do not hold to his Dispensationalism, I do affirm Pre-Millenialism which was held by the Primitive Church. I, along with Cone, hold that authority is found in the Bible alone instead of the church development (“historic theology” in the article) of the Reformation and Roman Catholic Church of which Reformed Theology wants to find connection. God does build His Church but this is apart of any organizational or institutional inputs. Here I refer to the statement of Jesus in Mt. 16.17b-18a: “You are blessed, Simon son of Jonah, because flesh and blood did not reveal this to you, but my Father in heaven! And I tell you that you are Peter, and on this rock I will build my church.” The antecedent to “rock” is the revelation from the Father which Peter received and not Peter himself. The Roman Catholic position on this verse is that there is a word play in the Aramaic that Jesus was speaking. They claim that Peter (petros) becomes the rock (Petra), and so a human institutionalism is created, with the church built on Peter (and his successors). So the Roman Church says that grace is dispensed from their institution instead of the risen Christ of which the scriptures affirm. This is an argument from silence as the text, which is inspired (see 2Tim.3.16, 2Pet.1.21) was recorded in Koine Greek. No, the entire scriptures affirm salvation is from God alone now mediated by Christ alone and apart from any institutional agency. Reformed Theology want to merely reform Roman Catholicism instead of finding authority solely in God and His word. 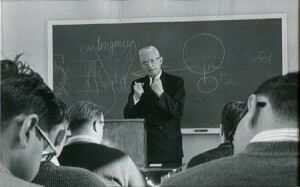 Here is why I argue that reformed epistemology isn’t sufficient on its own, and that dispensational epistemology must be distinct from it:Cornelius Van Til is brilliant on what I would call the first three pillars of Biblical epistemology (#1: Biblical God exists, #2: He has revealed himself authoritatively, #3: Natural man’s incapacity to receive), but his epistemology falls short in that he does not account for hermeneutics (Pillar #4) within his epistemology. In fact, in his Th.M thesis, “Reformed Epistemology,” he never once even discusses Biblical interpretation. Much of his critique of other thinkers, like Kant, includes considerable discussion of their deficiencies in the interpretation of experience, but not a word about interpretation of Scripture. Not one. How can Van Til build such an outstanding foundational framework on special revelation and then totally ignore the centrality of hermeneutic method for understanding that revelation? You see, it all has to do with where one places hermeneutics: I consider Biblical hermeneutics as an absolutely necessary component of epistemology. Hermeneutics falls within the realm of epistemology. Van Til does not seem to share that conviction, even though he critiques the hermeneutics of others’ bases of authority (i.e., experience) within an epistemological context. Still, while not considering hermeneutics an integral part of epistemology, he does give hermeneutics attention elsewhere. In his The New Hermeneutic, for example, Van Til concludes, with these words, “…we would appeal to the Cahier’s men, to Wiersinga and to others, to build their hermeneutical procedures on the theology of Calvin, Kuyper, Bavinck, etc., (emphasis mine) and then in terms of it to challenge all men to repentance and faith in the self-identifying Christ of Scripture instead of making compromise with unbelief” (pp. 180). Notice his prescribed hermeneutical procedures are grounded in historical theology, rather than literal grammatical-historical. In short, Van Til is marvelously consistent in his epistemological method until he arrives at the hermeneutic component. At that point his writing shows, in my estimation, two deficiencies: (1) he does not grant hermeneutics its proper and necessary place in epistemology, and (2) when he does consider hermeneutics, he prescribes historical theology as the orthodox hermeneutic, rather than literal grammatical-historical – an unfortunate contradiction of his own expertly stated first principles. The Biblical epistemological model does not share these two deficiencies, and leads me to consider that while Van Til is outstanding up to a point, we cannot simply adopt his reformed epistemology without ourselves walking more consistently down the reformed path.